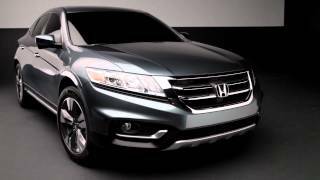 Honda’s official unveiling of its all new car concept in the 2012 New York Auto Show turned out to be quite a newsmaker in the automobile industry. 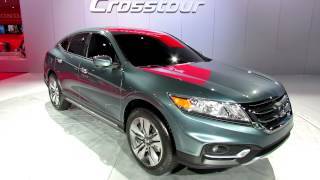 The company seems to have made remarkable changes in the styling of this SUV-like vehicle (rather, midsize CUV), the Honda CrossTour Concept 2013. The CUV has been given an aggressive and appealing styling at the same time. The eye-catching headlights of the car come in an extended line of the enhanced grille induced in the car. If we consider just the exterior of the concept, the vehicle looks equally appealing from the back as well. The rear-fender finish at the back adds to the solid back appearance of the vehicle. Moreover, it’s being rumored that the concept has been fitted with exclusive 19-inch rims, but as per some company officials, the production models will get 18-inch rims only. The automakers seem to have kept fuel economy equally in their minds just as they did with styling. The car will be made available in two different fuel-efficient powertrain options with front-wheel drive (and limited all-wheel drive), and with two different transmissions. The first model of the concept features a 192hp 2.4L iVTEC inline 4-cylinder engine coupled with 5-speed automatic transmission, while the other model features a 3.5L V6 engine (along with cylinder-deactivation technology) mated with 6-speed automatic transmission. Apart from this, there are many other handy features that we can encounter in this NextGen concept. These include SMS text function, Pandora internet radio interface, LaneWatch System and unique ‘blind spot display’. A couple of two other safety features has given the CUV an edge over all other SUV-like vehicles. The Forward Collision Warning System (an alert system against even slightest of touch in front) and the Lane Departure Warning System (alert system against off-track movement) are all that one needs for a tension-free drive. The company has still preferred to cloak other interior features (including trim works) along with the price tag of the car. 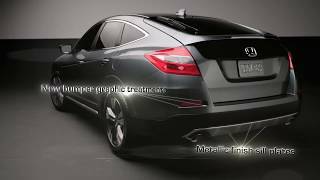 As the officials asked everyone around to stay tuned to the updates of the 2013 Honda Crosstour, be it interiors or the price of the concept, it seems that buyers will have to shell out good amount of money to have it placed in their garage.